EMC community – Step inside the 1950s cottage on Manotick’s Highcroft Drive, and you’ll find a home as dedicated to art as it was when A.Y. Jackson built it. The house is part of the Homes for the Holidays tour in support of the May Court Hospice Nov. 9 to 11. The updated home is certainly modern – its owner is an interior designer – but the charms of the Group of Seven painter’s final house still shine through. Paintings from all genres adorn the walls, and sculptures, decorative urns and glass plates dot the naturally-lit studio where Jackson once painted. A zebra skin rug pops against the original wood-burning fireplace and built-in bookshelves, where Jackson kept his art supplies and reference materials. A drafting desk sits where he once did – its owner Irene Staron designs there in his stead. “It allows me to live true to my core. I bring art into my work and encourage people to surround themselves with real art,” she said. She will introduce her home to as many as 2,500 people who are expected to take part in the tour. The Homes for the Holidays tour helps support palliative and end-of-life care programs at the Hospice at May Court. In its 10th year, fundraising manager Jana Rand said the event aims to raise $150,000 – a small fraction of the $1.3 million the organization needs to run its programming. Seven homes across Manotick, the Glebe and Rockcliffe Park have been chosen for the tour this year, which will be all dressed up for Christmas. One of the homes is the Korean embassy, to mark the 50th anniversary of Korean-Canadian relations. The tour homes are decorated with flowers from local florists, all of whom donate their time and inventory to the cause. The Mill St. Florist will provide the decor for 1176 Highcroft. Staron said supporting the hospice is important to her because it provides a place for people to live and die with dignity. Her own mother died 14 years ago, and she wished at the time that her mother’s last days were spent somewhere other than a grim hospital. “I was very impressed (with the hospice). It’s in a natural setting, and the scale of the building is human. It’s not institutional, it’s comfortable,” she said. Staron said there are many stories to tell about the architecture of her cottage and the Canadian artist who built it. The home is still configured the same, but the kitchen has been updated and Staron has made use of every space to lead a comfortable life. The home was built on the property’s highest point in order for the artist to see the river and fields beyond, but now the trees have grown up to block the view. Jackson lived in the house for about a decade in the 1950s and 60s, before he was too ill and moved into the city. His friend and fellow artist Hubert Rogers bought the cottage from him, and also spent his later years there. Jackson’s niece still lives next door, and Staron has a signed copy of his book, “A.Y.’s Canada” in the studio. But Staron’s home isn’t the only one with celebrity influence. One of the Glebe homes on the tour, 196 Glebe Ave., features a garden designed by Oprah Winfrey’s resident gardener. The second Manotick home on the tour this year is located at 5572 Carrison Drive off Potter Road. It is a French Country Style home designed by US architect Jack Arnold. 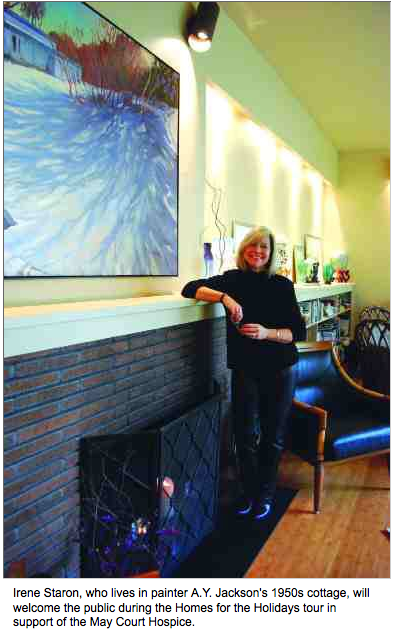 The three-day event begins on Friday at 10 a.m. and unlike most of the homeowners, Staron will be in the home during the tours to share some of her knowledge about the artist and the house. On Friday, Nov. 9, she will have artist Kathy Haycock in the cottage as a guest of honour as well. Haycock painted a large rendition of the house in winter for Staron, which hangs above the fireplace. Visitors can meet the artist while touring the home. The May Court Club of Ottawa, located in front of the hospice, will also take part in the tour, offering a pit-stop for ticket holders to grab a coffee or tea, or a desert. Rand said the May Court Club boutique will sell jams and jellies and crafts throughout the weekend. Tickets for the event are $40 and can be purchased at the hospice, at 114 Cameron Ave., online at www.hospicemaycourt.com or at one of the organization’s fundraiser’s partners, listed on the hospice’s website.